Interwar Maisons du people (Houses of the People) integrated social, political and cultural programs in ways that exemplify how architects negotiate complex relations between social vision, formal expression, technique, identity and power. 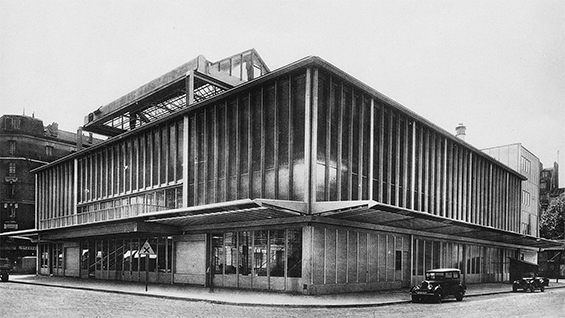 In the groundbreaking Maison du peuple of Clichy, architects Eugène Beaudouin and Marcel Lods’ ingenious spatial and temporal scheme combined a market, multi-purpose hall and union offices. Metal designer and fabricator Jean Prouvé and engineer Vladimir Bodiansky turned the scheme into a working building/machine. The structure’s mobility and mutability echoed its multipurpose program. However, the encounter between Beaudouin and Lods’ preoccupation with mass production and Prouvé’s craft-inflected practice was complex. Grounded in the material reality of sheet steel fabrication, Prouvé’s experimental prototypes were infused with the spirit of the bricoleur (tinkerer). This lecture examines the evolution of the Maison du peuple project focusing on the work of Atelier Jean Prouvé. It raises the question of how Prouvé's artisanal fabrication practice, deployed in the service of a socially and programmatically experimental project, can expand our understanding of interwar “Machine Age” modernisms and their relevance today. Architect and architectural historian Ariela Katz is Associate Professor at the École nationale supérieure d’architecture Paris-Malaquais, where she teaches both architectural history and design. Her scholarly research and teaching focus on ideology and aesthetics in interwar European architecture, Modernisms beyond Europe and critical reevaluations of recent theory and practice. Her design studio, taught in conjunction with choreographer Julie Desprairies, focuses on site specific interventions and alternative architectural practices. After practicing architecture in New York City, Professor Katz taught in the Columbia GSAPP’s New York/Paris Program, which she directed from 2003 to 2007. She has also taught at the architecture schools of Paris Belleville, Versailles and Lille. She has participated in design juries at various architecture schools in the USA and France, including Columbia, Rice, Georgia Tech and Florida International University. Professor Katz received her B.A. in Humanities from Yale University, her M.Arch. from the Columbia GSAPP and her Ph.D in Architectural History from the Institute of Fine Arts, NYU. She has received research awards and fellowships from the Graham Foundation, the SAH and New York University. She is currently a member of the Architecture Culture Société (ACS) section of the UMR AUSser research center of the CNRS.